The key to successful spray basting is a light, even spray. Here are a few more facts about spray basting, before we get started on the tutorial. 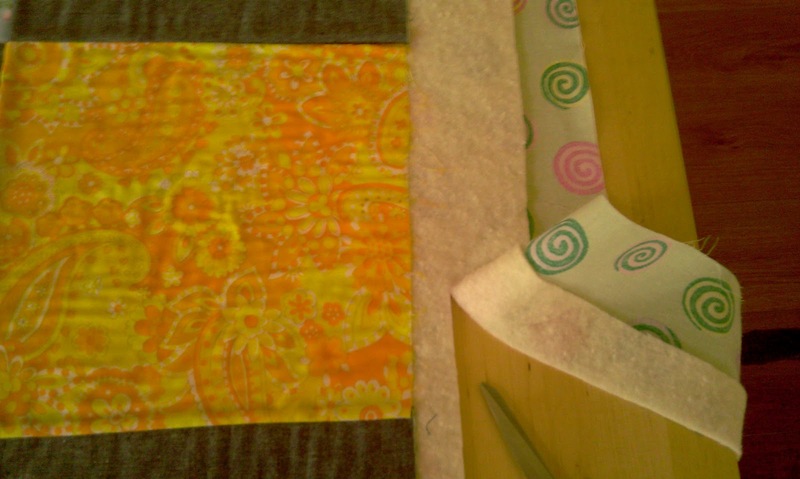 * The adhesive spray in no way harms your needle or machine during quilting. * It comes in 2 sizes – the small tin (250ml) will easily cover 2 lapsize quilts. The large tin is 500ml. * There is a slight smell to the adhesive (despite it being described as odourless on the can), so use it in a well ventilated room. 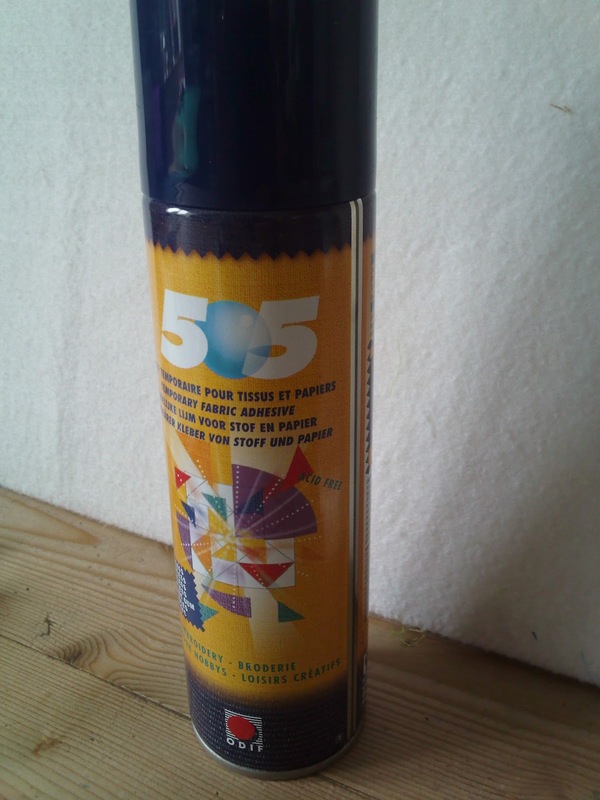 * Where possible, always spray onto the wadding. * You must wash the adhesive out of your quilt when it is made. However, for wallhangings and smaller projects I tend to leave it in as it gives a slightly more structured feel. * You will need to wash down your table/surfaces after spraying, with hot soapy water. * If using basting spray on smaller projects, keep an old shower curtain/sheet handy to spread out on your table when spraying. This will protect your surfaces and can then be thrown into the wash after several uses and reused when dry. * I haven’t tested how long basting spray remains adhesive i.e. 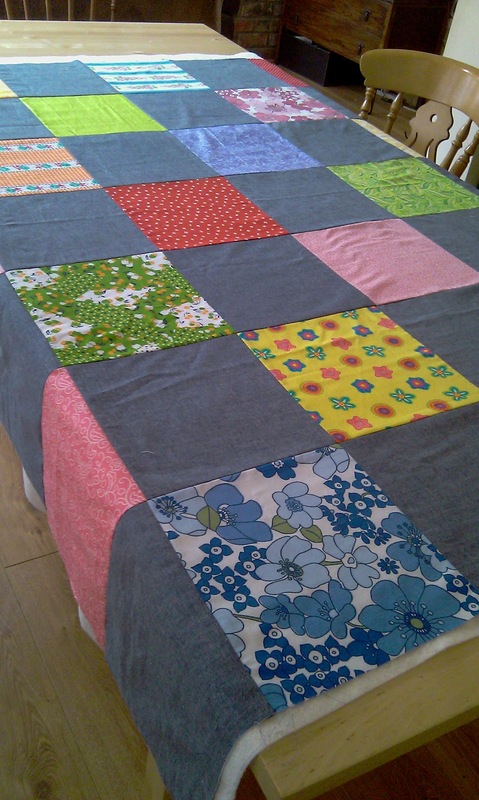 when you’ve basted a quilt, but don’t get around to quilting it for a while, however I spray basted a quilt over a year ago and the layers are still stuck together! 1. 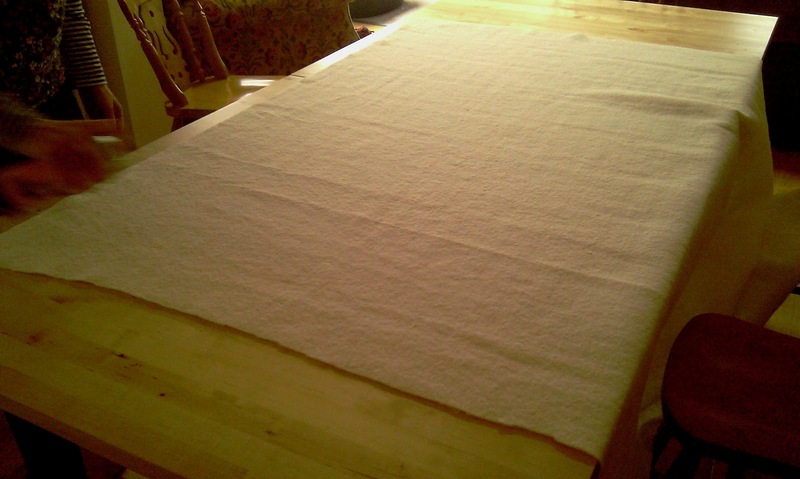 Find a large enough surface to lay out your wadding (already cut slightly wider than your quilt top). 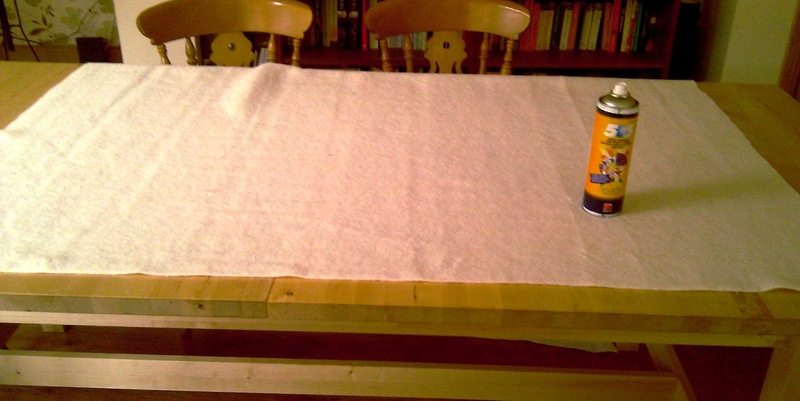 I use my dining room table, however you could use the floor (if your floor is wooden/laminate/tiled, then you might need to stabilise the wadding with masking tape, to stop it slipping around too much). 2. 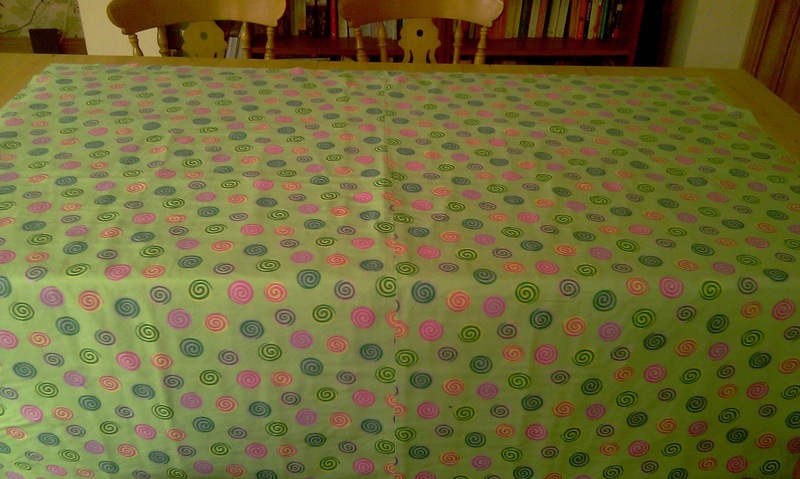 Lay the wadding out first, followed by the quilt top (right side facing up). 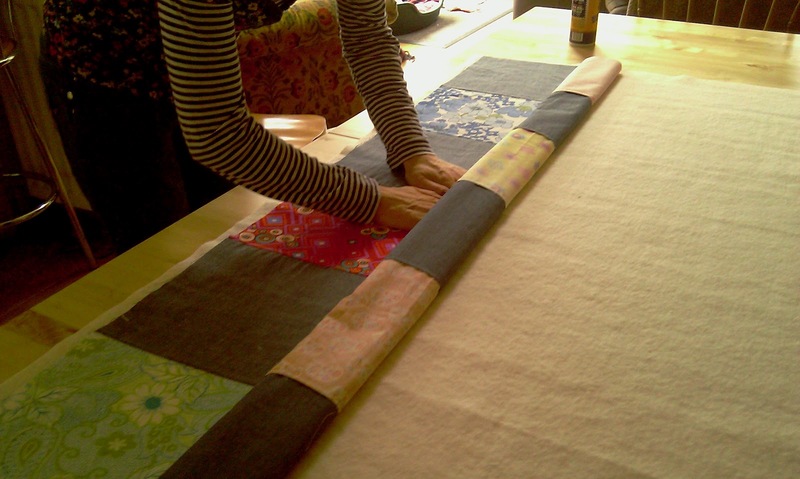 Make sure the quilt top fits inside the wadding, and smooth out any wrinkles. 3. Start rolling up the quilt from the bottom to the top, keeping it straight and even all the way. When you get to the top, carefully lift it off the wadding and lay to one side. 4. 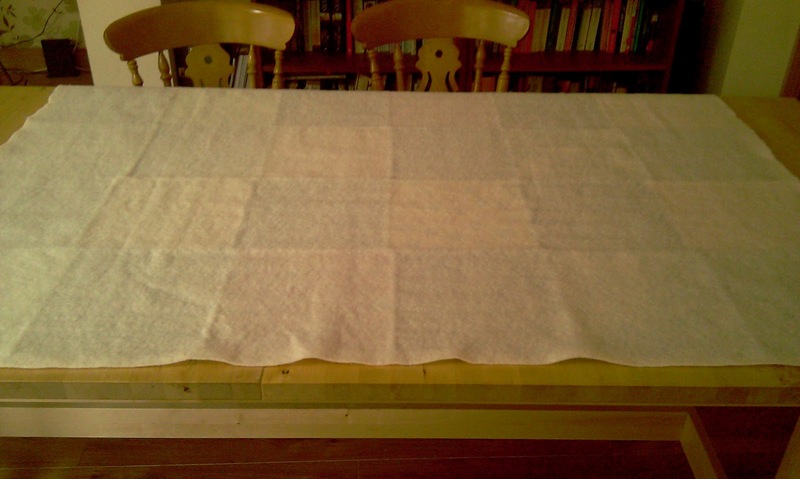 This is where I turn my wadding round so that I can fit the full width onto the table. The excess wadding hanging over the edge is resting on some chairs. 5. Time to spray! I’m right handed, so I start spraying from the bottom right hand corner, working my way to the left hand corner, keeping the can at least 12″ above the wadding. Height is the key to a fine, even spray. Try not to have too much or too little adhesive in one place. Remember to spray right to the edges of your wadding. 6. 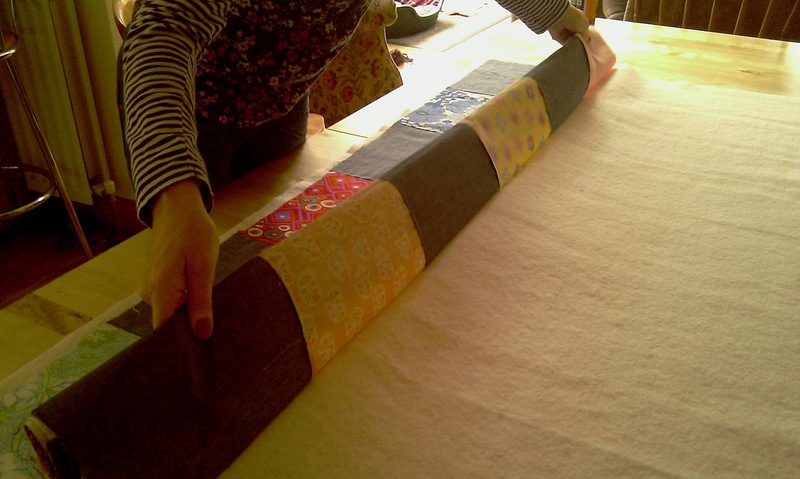 Carefully position your rolled up quilt top onto the nearest edge of the wadding, placing it just inside the edges of the wadding. 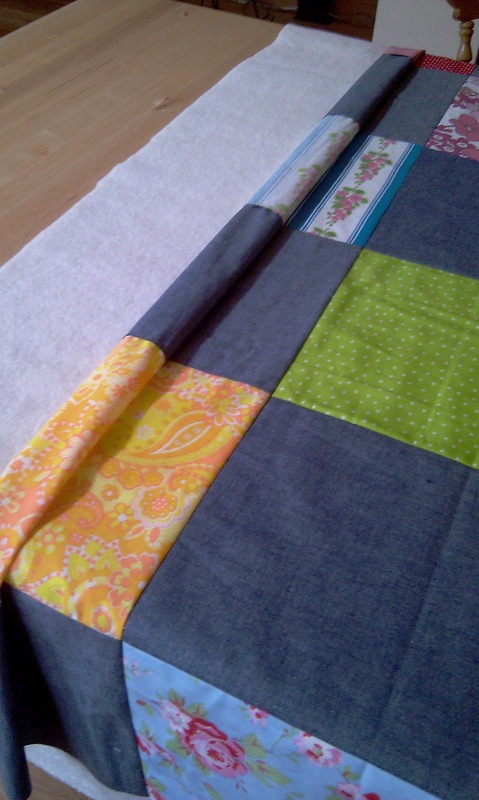 Start smoothing from the middle of the quilt out to both edges. 7. 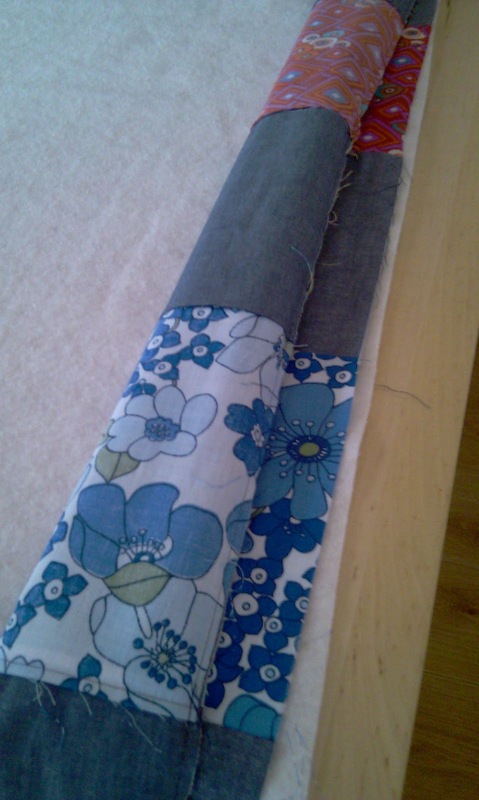 Roll the quilt a short distance and smooth over it, working from the middle out towards the edges. 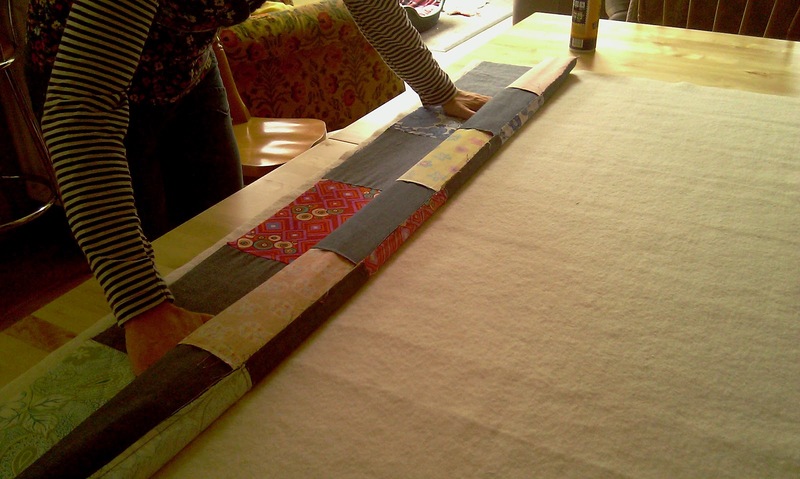 Tip: Don’t over-smooth the fabric or stretch it, just smooth it enough to get rid of air bubbles or wrinkles. If you make a mistake, or get a wrinkle don’t worry. You can just peel the fabric back off the wadding and smooth it back down again. There’s no need to re-spray. Also, keep a check on how your seams are lying underneath. Feel with your hands to make sure that seams aren’t flipping back the wrong way as they get stuck down. 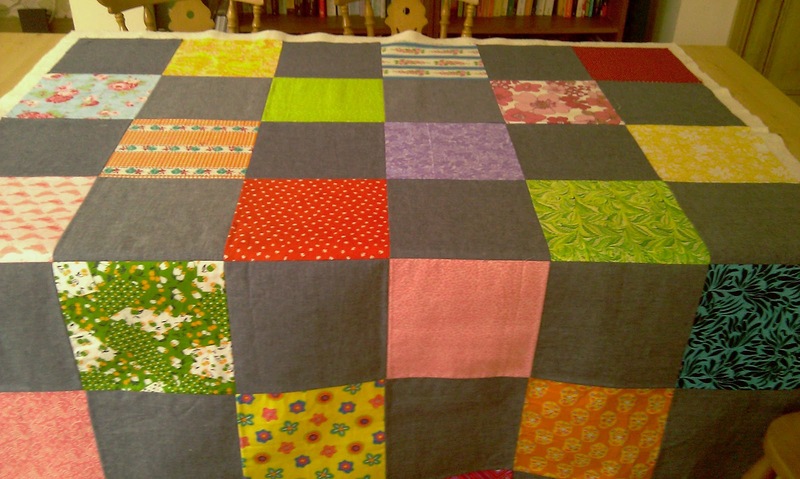 They will cause lumps & bumps otherwise, which isn’t good for quilting! 8. Continue in this way until you’ve covered the first section that you sprayed. To find out where you need to start spraying the next section from, lift up the roll and it will stop at the edge of the first sprayed section. 9. 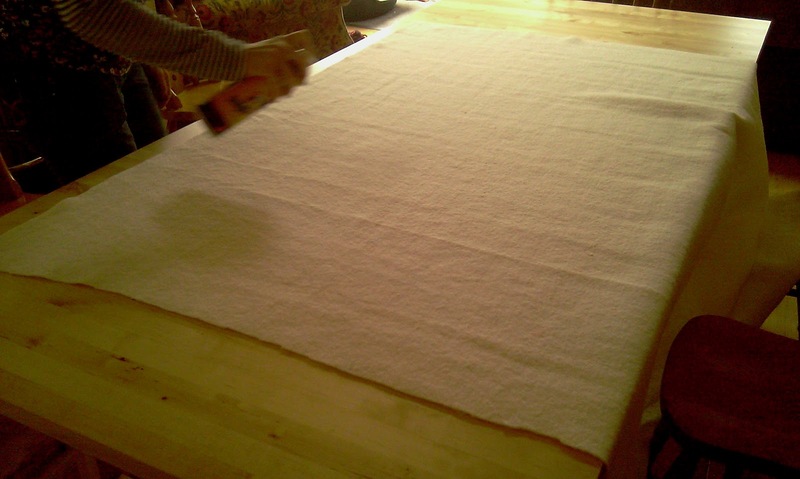 Place the roll down on the stuck down section, and spray another 12″ section across the width of the wadding, as before. 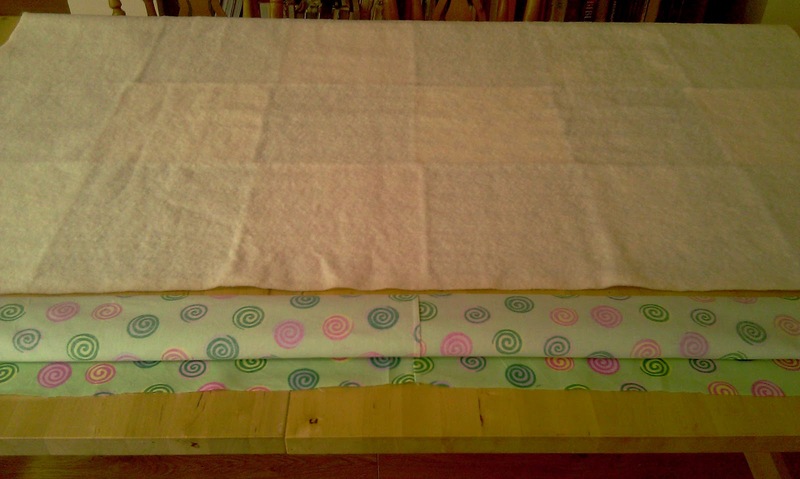 Continue rolling, smoothing & spraying until the quilt top is completely stuck down. 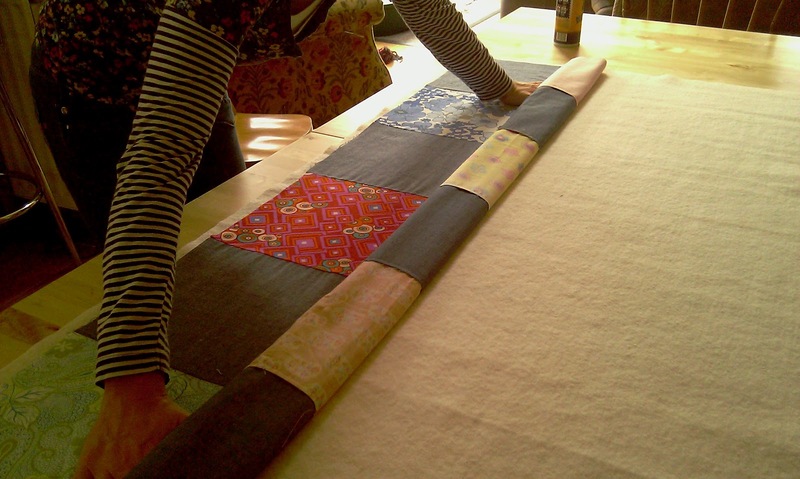 Tip: To save my poor back from breaking during this process, I slide the quilt towards me with each new section that I spray and smooth, which means I don’t have to over-reach. 10. Now flip the whole piece over, and repeat this process for the backing – laying it on top in position, rolling it up, and spraying & smoothing it on in 12″ sections at a time. 11. 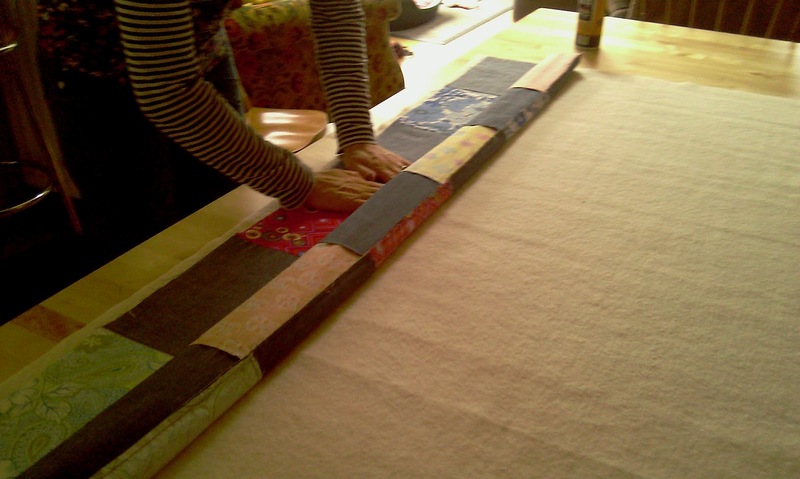 Trim off the excess wadding/backing. Now you’re ready to quilt! You will notice in the picture above that you get a wrinkly look to a spray basted quilt. This is normal. If you think of it like a vacuum packed bag, when all the air is taken out of it, all the layers stick together and create a slightly textured look. This won’t affect your quilting or the end look of your quilt. 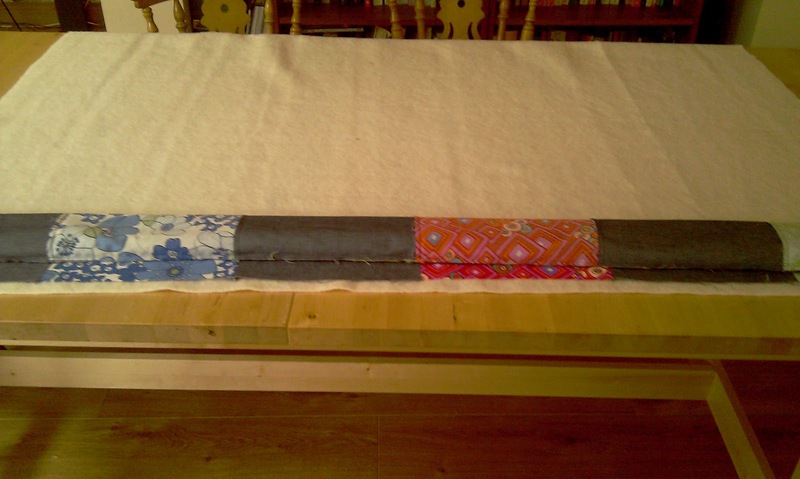 Provided there are no air pockets left in the quilt, the 3 layers will remain stable and won’t move about. I hope you find this product as helpful as I have and enjoy this tutorial.